High school math teacher Andrew Strom felt thrilled when he was recruited for an eight-week stretch working with Arizona State University engineering researchers this past summer. Another feeling emerged once he began getting immersed in the researchers’ projects. “It was very humbling because I realized I don’t really know anything,” Strom said with obvious humor. But the thrill wasn’t gone. It was amplified. “What I saw is that there is so much new knowledge and information out there being generated in science and engineering, so much to be learned. It’s incredible,” said Strom, who has taught at Corona del Sol High School in Tempe, Arizona, for 23 years. Strom’s recent endeavors with faculty and graduate students in ASU’s Ira A. Fulton Schools of Engineering took place at the facilities of the Sensor Signal and Information Processing industry consortium, a National Science Foundation Industry/University Cooperative Research Center known as SenSIP. Professor Andreas Spanias, SenSIP’s director, helped Strom develop ideas for lessons designed to interest young students in engineering. One set of lessons helped students in Strom’s senior math and trigonometry classes to understand the complex fast Fourier transform algorithm for audio compression, a popular mathematical method used in engineering applications. Strom’s lessons focused on examples such as illustrating connections between the dynamics and spectrum of sound and how those apply to the electronics involved in making and recording music. “It’s something that kids can relate to, and it shows them the kinds of things that all those mathematical formulas and equations help to make happen in the world,” Strom said. Beyond that, such lessons help teachers give students an in-depth view of the cool things researchers are doing and discovering — which can ignite a motivating flame that will drive students onto career paths in science, engineering, technology and math, Strom said. That outcome is precisely the aim of the NSF’s Research Experiences for Teachers in Engineering and Computer Science program, RET for short, which opened the door for Strom’s summer stint with SenSIP. Four other ASU research centers led by Fulton Schools faculty are giving teachers from kindergarten through community college similar opportunities — funded by stipends from the NSF — through the RET program. Nanotechnology-Enabled Water Treatment Systems, known as NEWT; Quantum Energy and Sustainable Solar Technologies, called QESST; and the Center for Bio-mediated and Bio-inspired Geotechnics, known as CBBG, have altogether brought dozens of these teachers into their labs for five- to eight-week RET sessions over the past several summers. NEWT and CBBG are NSF Engineering Research Centers, while QESST is a joint NSF and Department of Energy Engineering Research Center. The Nanotechnology Collaborative Infrastructure-Southwest, known as NCI-SW, has hosted one or two teachers for the past few summers in its own RET program, which coordinates its activities with the QESST center’s program. SenSIP has hosted a single teacher so far but is seeking an RET program grant to recruit as many as eight teachers for next summer. Some teachers have been so impressed with their experiences that they have returned for a second summer of research and then a third summer as peer mentors for first-time teachers participating in the programs, says Jean Larson, the education director for CBBG who coordinates its RET program. The RET program’s primary focus is on drawing teachers from underserved communities, particularly those with at-risk youngsters or students living in areas where socioeconomic factors make them less likely to be exposed to engineering and science, says Larson and Christina Crawford. Crawford coordinates RET programs from Rice University in Houston, the lead institution for the NEWT research centers. Larson and Crawford emphasize that RET sessions are designed to not only guide teachers on specific ways to more effectively teach science and engineering and develop curriculum, but also on how to tailor their teaching methods and approaches to the cultural, social and demographic environments in which their students live. For his fourth-grade students at the Blackwater Community School in the Gila River Indian Community, Lance Reyna devised a research project to explore the negative health impacts of fugitive dust — soil particles that can cause poor air quality. Reyna did studies on the subject as part of a Research Experiences for Teachers program at an ASU research center. During his summer research program activities in the labs of the SenSIP at ASU, high school math teacher Andrew Strom also got a look at work in other research centers’ facilities, including the Solar Power Lab at the MacroTechnology Works facility at the ASU Research Park. Wendy Cullivan, a high school biology teacher, gave a presentation to students on a concrete-permeability project she collaborated on during one of three Research Experiences for Teachers summer sessions she has participated in at ASU engineering labs. Teacher Scott Currier devised the Infinite Spinner Challenge for his fourth-grade science classes. Students used solar panels, a small direct-current electrical motor and recycled materials to build a device that operates a fidget spinner. Currier developed the project based on what he learned in Research Experiences for Teachers programs at ASU. As part of his work in one of ASU’s Research Experiences for Teachers programs, high school teacher Finn Pillsbury gave a demonstration on geotechnical engineering research to high school students in the Transportation Engineering Experience at ASU summer program. They learned about tecniques for making soil more resistant to the liquefaction during earthquakes. In some cases, the research projects the teachers get involved in align with environmental challenges in their communities. Lance Reyna has taught elementary school students for most of his eight years at the Blackwater Community School in the Gila River Indian Community. He participated in CBBG’s RET program this past summer, joining a team researching fugitive dust. Fugitive dust is made up predominantly of fine-grained soil particles — composed of silica, aluminum, calcium and iron minerals, among others — that can escape into the atmosphere and cause respiratory irritation in humans. The airborne particles are also associated with increases in cases of Valley fever as the spores responsible for the fungal infection are transported into the air along with the soil particles. High levels of fugitive dust are a persistent problem in the Gila River community’s open desert environs, so people living there are often inhaling a lot of dirt, dust and bacteria, Reyna said. The school regularly puts green, yellow, orange or red “health flags” on its playing field to indicate air-quality conditions. A red flag indicates poor air quality and means schoolchildren are not permitted to play outside. So what Reyna learned from his ASU research was especially relevant to his fourth-grade students at Blackwater. When he gave lessons about fugitive dust — lessons he titled “Gone with the Wind” — “my kids could relate firsthand to what I was talking about,” he said. Scott Currier, a fourth-grade teacher at Highland Lakes, a K-8 school in Glendale, Arizona, has joined in RET programs at ASU for the past three summers — once in CBBG, twice with QESST. ASU researchers, especially the graduate students, created a working atmosphere that was “super high-energy and fun,” Currier said. More satisfying has been the change he has seen since he began teaching lessons based on his experience in the RET programs. As a result, Currier reports a notable jump in the percentage of his students meeting or exceeding the testing standards for science proficiency — now at more than 90 percent, compared with about 80 percent before he participated in the RET programs. Wendy Cullivan, who recently began teaching biology at McClintock High School in Tempe after 13 years teaching eighth-grade science classes, is another veteran with three summers in RET programs, two with QESST, one in CBBG. What she has learned has helped enable her to compose several days of “fun,” interactive lessons on solar energy and the urban heat-island effect, plus “how to make concrete interesting to students,” Cullivan said. Working with skilled researchers, “you start seeing the connections between what’s going on in science and how that is shaping our lives,” and showing those connections is the key to stoking students’ curiosity. The RET program “inspires me as a teacher to learn more about science and engineering, so I try to pass on that inspiration to students,” Cullivan said. Michelle Jordan says teachers are learning not only from university researchers but from the other teachers they participate with in the summer sessions. Jordan, education director for QESST and coordinator of its RET program, is also an associate professor in ASU’s Mary Lou Fulton Teachers College with expertise in educational psychology and the learning sciences. The teachers are also finding ways to give back to the RET program. Besides returning to RET summer sessions as mentors, some of the teachers have helped the ASU research centers with other outreach projects, attended workshops and conferences and written articles on their RET experience for educational publications. RET program coordinators also stay in touch with teachers to assess how they are continuing to apply what they’ve learned to their classes and how it is impacting students’ learning. “Our relationships with these teachers are extensive and long-lasting,” Jordan said. RET teachers also benefit from working alongside some of the top students from colleges and universities around the country who come to ASU for summer sessions supported by the NSF Research Experiences for Undergraduates program and with high schools students in the NSF Young Scholars program. Some teachers also collaborate with local community college students involved in the education outreach efforts of the NCI-SW research consortium. The NCI-SW RET program offers teachers opportunities to learn about research in six high-profile laboratories and centers at ASU doing work that involves a range of nanotechnology applications in electronics, energy, manufacturing, materials engineering, environmental engineering and development of advanced biotechnologies. “The feedback we get from teachers tells us they’re most excited about the exposure to new ideas and to different people, students and faculty, who are doing so many different and fascinating things in their research,” said NCI-SW education and outreach coordinator Raymond Tsui, who came to ASU with three decades of engineering experience in the high-tech electronics industry. Tsui and his fellow program coordinators and research center education directors Larson, Jordan and Crawford stress that their ultimate measure of success is when the motivation RET teachers derive from their experiences at ASU is passed on to those educators’ students. There’s a palpable buzz inside the gym at the Harry & Sandy Rosenzweig Boys and Girls Club in metro Phoenix. Her nerves, though, are quickly quelled by her pride. “It’s rewarding to see everything that we’ve put into this and seeing it all come together,” she said. The health fair is the culmination of months of hard work and preparation by these nursing students as part of their NUR 459 course, which focuses on the development, implementation and evaluation of a community action project. Simply put, it’s a hands-on introduction into the world of community health nursing, where education, health promotion and illness prevention are the primary goals. “We’re practicing our nursing skills by teaching people and hopefully encouraging them to lead healthier lives,” said Julie Nguyen, a senior nursing student. Their instructor, College of Nursing and Health Innovation Clinical Assistant Professor Jennifer Costello said they spent an entire semester striving to get to this moment. First, the students had to identify a population, then they had to assess it to find out what the health needs were. “They took all that data and analyzed it in order to come up with the elements you see here, which are areas of community health where the kids need a little bit of extra help,” Costello said. The result: several tables set up around the gym, with posters and activities addressing topics like how to wash your hands properly, day-to-day hygiene, stress management and specific activities to get the kids moving. “The students took into account the areas the kids live in. There’s not a lot of green spaces so they can’t get out and safely exercise so they’re focusing on things the kids can do in place, like jumping rope and hopscotch,” Costello said. After only a few minutes, it was clear the kids were having a good time at each of the tables. Of course, the goal is that their enjoyment translates to healthier habits that stick with them once the health fair is over. The Boys and Girls Club of Metro Phoenix was a gracious partner. The branch’s program manager, Vannessa Moreno, said it was a great experience working side-by-side with the nursing students in order to help make this event happen for the kids. “This is really a two-fold opportunity for our kids, not only are they getting some amazing knowledge to back up a lot of the programs we’re doing here at the branch but they’re getting to see faces of kids who are in college and we hope that gets them excited, thinking, this is what I can do when I get to ASU,” Moreno said. "The benefits are limitless." For the College of Nursing and Health Innovation students who will soon graduate and go into practice, it’s been a productive primer into an oft-forgotten area of nursing: community health. “First of all, it's eye-opening and we can bring this to our future,” Rivera said. The students are graded on the event itself plus things like teamwork and the community assessment that led them to this intervention. However, Costello — a community health nurse herself, having worked as a school nurse for more than 20 years — would like to see this lesson last well beyond the final grades. Students from the College of Nursing and Health Innovation prepare to host a health fair at a Phoenix-area Boys and Girls Club. 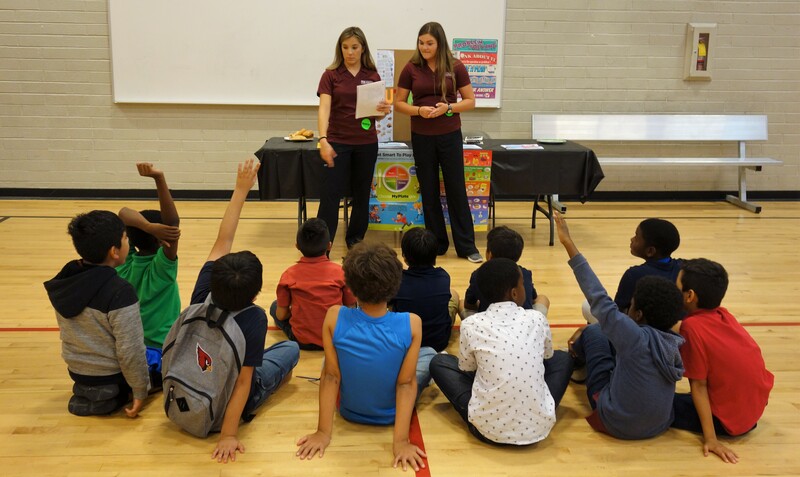 ASU nursing student Julie Nguyen talks about proper hand-washing with elementary students at a health fair she and her classmates put together. Health fair participants draw and journal as part of the stress management lesson created by ASU nursing students. ASU nursing student talks about hygiene with health fair participants. “I am hopeful that through the entire process they have learned how valuable a community assessment is and how important collaborating with interprofessional colleagues is to the success of a community,” she said.